Freestanding S-plan quay, built c.1867, with bowed terminus, and creating two artificial harbours. Recent addition to north-west blocks entrance to western harbour, and recent retaining wall to south along approach road. Battered rubble stone walls of squared limestone blocks with limestone steps to water level to north-east elevation. Recent concrete parapet wall to interior elevations of western harbour, limestone and concrete coping with cylindrical granite mooring posts and iron mooring rings. Rubble stone and concrete retaining wall to approach road with both concrete steps and protruding stone steps to north elevation. Modern repairs to parts of quay from storm in 1991. 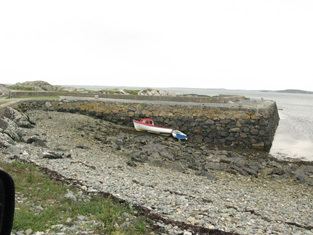 It is evident that considerable effort went into the construction of this pier which is attested to by the size of the large cut limestone blocks of which it is constructed. This quay performs the important role of protecting boats for the local community which grouped together to raise funds for reconstruction of the pier after a storm in 1991 which almost destroyed the quay walls. It retains many interesting features such as the granite mooring posts, iron mooring rings and stone steps, all of which contribute to the functionality and aesthetic quality of the quay.